Shine laser light on a hologram and you see a sharp image in three dimenions. Cut the hologram into tiny pieces and shine the laser on one piece, and you still have a three dimensional image, just much fuzzier. We are all like holograms. There’s little bits of us in all the people to whom we are connected. And part of them in us. The richer our relationships the brighter our picture. We are parents to our children. Lovers or companions. Partners. Employers and workers. Leaders. Playmates. Brothers and sisters. Aunts and Uncles. Citizens. Leaders and followers. Opponents. Challengers. Inspirers. Doctors. Plumbers. Lawyers, Teachers and Nurses. Missionaries. Warriors. The more cut-off or isolated we are from others, the fuzzier we become. The richer our connections with others, the more brilliant the image. 1. 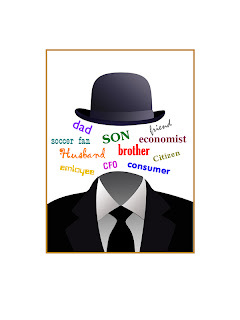 Each of us has a number of identities or roles that we play in life (i.e. mother, daughter, consumer, employer, etc.) Make a list of your identities/roles. 2. Which are your favorite identities, and why do you like them? For example: “mother: I feel loved and needed, artist: I love to express myself”. 4. Thinking about what we have just said about our many identities and the relationships that flow from them what is the essence/quality/structure/features of identity? 5. What do our identifies/role have in common and how are they different? 6. What identities do you hold/roles you play, that you would like to approach from the perspective of another identity and why? 7. Describe the qualities of one role/identity that you would like to bring to another (e.g. I would like to lead my staff more from the perspective I hold when I am being a father to my son. Wisdom, strength, humor.) and how this would enhance the relationships you have with others who know you in this role? 8. How could you apply what we have learned/discovered about identity/relationships to some project/situation in your group/your life?